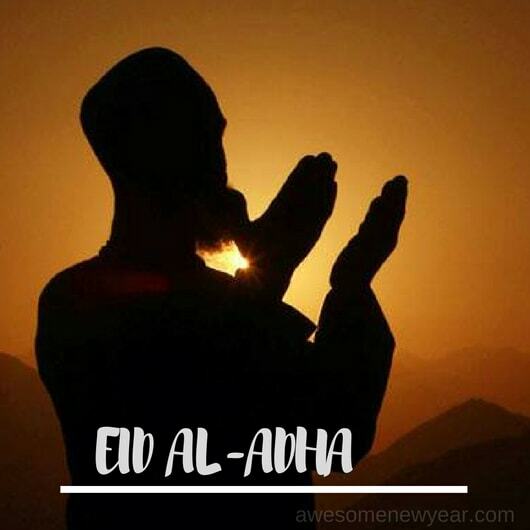 Eid al-Adha is one of the two most important festivals of Islamic festivals around the world. Millions of muslims around the world including countries like India, Indonesia, Turkey, and Pakistan celebrates Eid al-Adha. This festival is also known as the “Feast of the Sacrifice” and “Greater Eid”. According to Islamic Books, One day God instructed Abraham to bring Hagar, his Arabian (Adnan) wife, and Ishmael to Arabia from the land of Canaan. When Abraham was preparing for his return journey back to Canaan from Arabia, Hagar asked him, "Did God ordered you to leave us here? Or “Are you leaving us here to die?" at that time Abraham did not even look back. Abraham just nodded for his question. Then Hagar said, "God will not waste us, you can go". Even though Abraham large quantity of food and water with them, these supplies ran out quickly and in few days the two began to feel the hunger and dehydration. Hagar ran up and down between two hills, Safa and Marwa, in her desperate quest for water. Exhausted, she finally collapsed beside her baby Ishmael and prayed to God for deliverance. Miraculously, a spring of water gushed forth from the earth at the feet of baby Ishmael. After Many years, Abraham was instructed by God to return from Canaan to build a place of worship right adjacent to Hagar's well. Abraham and Ishmael constructed a mortar and stone structure which is known as “Kaaba. This place is the gathering place for all the people who wish to strengthen their faith in God. As the years passed, Ishmael was blessed with prophet-hood and gave the nomads of the desert his message of submission to God. Abraham's main trail of his life was to face the command of God to “sacrifice his dearest son”. After hearing this command from God , Abraham prepared to submit to will of God. During this Shaitan the Devil tempted Abraham and his family by trying to deviate them from carrying God's commandment. Then Abraham drove Satan away by throwing stones at him. When Abraham attempted to cut his throat, he was astonished to see that his own son was unharmed and instead, he found a ram which was slaughtered. Abraham had passed the test by his willingness to carry out God's command.